Shallow Cogitations: What's Her Motivation? 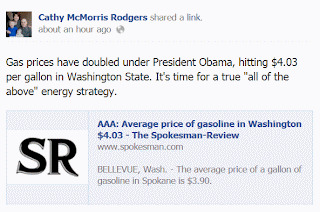 To hear Cathy McMorris Rodgers talk--okay, not talk, perhaps she's preoccupied with getting Washington Republicans to vote for Romney--but post on Facebook, you'd think that there's some sort of bizarro land logic that links gasoline prices to President Obama's energy policy. Yesterday she has this to "say". 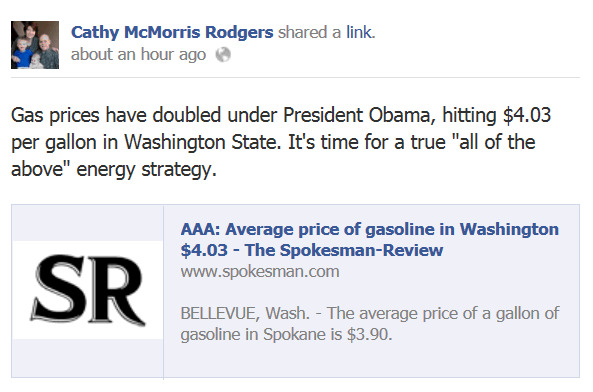 It's true gas prices are higher than before. It's also true they've been higher before. Our congresswoman has complained about high gas prices before but also left out important details that contribute to those high prices. Those details are still applicable today. Demand for gas is down in the United States and production has been up, which means the US has been exporting gas. But that can be problematic. There's at least one domestic downside to America's growing role as a fuel exporter. Experts say the trend helps explain why U.S. motorists are paying more for gasoline. The more fuel that's sent overseas, the less of a supply cushion there is at home. So why doesn't the price come down? The secret to making a profit in refining these days is for refiners to source crude oil domestically and then sell the refined products to US consumers at prices based on imported oil. And let's not forget the role of speculators. There's been a huge investment in wind energy production over the last few years and now that is in danger because The Republican House wants to allow the Production Tax Credit to expire at the end of this year claiming it's a waste of money. Jobs, claimed to be a number one priority for Republicans, are already being lost. What effect will this have? A loss of up to 37,000 jobs as well as a decrease in the amount of energy reaped from wind and a decrease in CO2 emissions offsets. In the meantime, billions in subsidies. i.e., corporate welfare. continue to go oil companies who also continue to make billions in profits. It appears Cathy McMorris Rodgers is less interested in informing and informed voters than she is in keeping the current president to a single term. Your critique of the Republican stance begs the question of how effective the Democrats were during the two years they held super-majorities in both houses and the Presidency. Answer: Democrats differed little from Republicans on energy policy. Yes, Big Oil is more of a Republican-sponsoring lobby. We've had oily Presidents like W., who was soaked in it. Obama has been more a crony of the nuclear industry, particularly of GE and Immelt, even as GE plants melted down in Japan. Yet, Obama is plenty oily too. Obama's alternative energy ventures were modest at best (not to mention Solyndra). More troubling, they were structured to add capacity to the existing grid rather than replace capacity and build alternate delivery structures. Obama doesn't get it. Obama's reaction to his own administration's regulatory failure with BP in the gulf was to expand drilling all over the US, including offshore. Obama could have used the BP crisis as a political basis for a reconsideration of energy policy. Democrats had the power to tightly control oil corporations and did little to exercise that power. For much of the BP crisis, Democrats were arguing like libertarians against regulation or even prosecution. Neither the Democrats or Republicans have done anything to limit coal exports to out-of-control China. If you really care about global warming, you have to care about not only direct emissions by the US, but US contributions to emissions abroad. Instead, Democrats contribute to the "clean coal" nonsense ideology. Where's the demand for science-based policy when it comes to coal emissions? The government should be determining oil production by fiat and distributing purchase rights to the citizens at large. The present bipartisan system of government subsidies for both fossil fuels and alternatives is economically and environmentally absurd. Ignoring external costs is an environmental disaster now, and a future economic disaster. Within the existing regulatory structure, increased oil production remains the most lucrative energy option. The badly structured market will inevitably drive production toward ever-more-risky extraction techniques. Obama's energy policy has been a frickin-frackin nightmare. Neither party wants to consider credible alternatives, because the status quo is too profitable. Neither party will stand up to Big Oil, Emperor Coal, or the nuclear lobby. Obama wasted so many useful energy crises, it's hard not to lament what he could have done. He inherited the Iraq War, and he emphasized domestic production, but not conservation. When BP spilled in the Gulf, the administration bizarrely expanded under-regulated domestic drilling and again de-emphasized conservation. Japan's nuclear crisis swung the public solidly against the dangerous hubris of this industry, but Obama appointed Immelt as the face of his jobs council. Obama avoided discussion of the even more treacherous issue of radioactive waste. The auto industry went bankrupt and the administration could have demanded rebuilt car design from the bottom up, but only tweaked efficiency from the edges, including more of the discredited mpg standard approach. The recession came dampening demand, yet gas prices rose, offering the perfect environment for a value-trade limit system on oil consumption that also would have stimulated the economy. Instead, the administration adopted drill-baby-drill (if not the slogan) and Democrats bowed to the energy industry in Congress. The stimulus got spent largely on road projects expanding car and truck infrastructure, and, as in Spokane, with an eye toward encouraging massive wasteful sprawl at the city edge. The drought came across almost the entire US, making even skeptics begin to reconsider global warming, and called into question our oil-dependent agriculture. Ethanol, which never penciled out energy-wise, looks even dumber when you do the calculations in the middle of a scorched cornfield. Obama continued ethanol subsidies. Even as power plants in the US switched to less-impactful natural gas, Obama embraced clean-coal rhetoric and cleared the way to burn more US coal in China. He signed more trade deals effectively undermining environmental standards both in the US and abroad. On just about every energy issue, Obama did exactly what a Republican would have done, save for a little weatherization or cash-for-clunkers diversions here or there. America still has no energy policy, despite the political opportunities afforded by an almost uncanny series of energy-related disasters. Don't forget the Democrats illegal war in oil-cursed Libya. The attack on the unguarded embassy is starting to read like Bush's slam-dunk WMD, and smell like the Gulf of Tonkin.